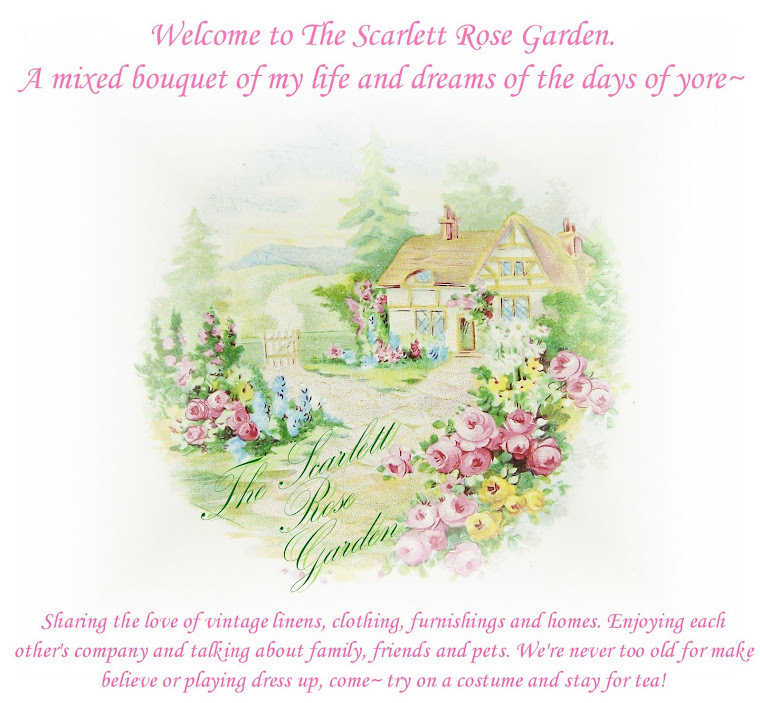 The Scarlett Rose Garden: Cottage goodies! Oh my goodness, do I have something pretty to share with you! New sheets! Just look!! Aren't they cottegy-licious?! C'mon, say it out loud~ you know you want to! My friend at work loves to go to yard sales and estate sales, and has recently rented a booth in an antique mall. She had these sheets there and I told her if they were still there the next time she went in, to please bring them to me. I thought for sure they would be gone... (they were only there a day or two). I was in luck! ( I had to pay her quickly before SHE decided to keep them!!) The price tag you see is what she paid for them at the estate sale. The photo is one that she had sent me, so I'll get some more later with them on my bed. OK.... next up is a little Christmas present I bought myself. 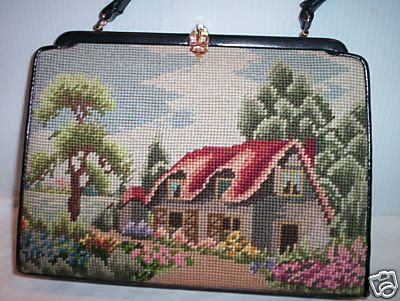 I love cottages, and I love vintage needlpoint purses. Could a girl get any more lucky than this? I got it for $30!! Now for some bad news, or perhaps blessings in disquise? Complete with a pink velvet change purse. Yah, I know.... here's a Kleenex for you too! Ok, on to the next sob story! 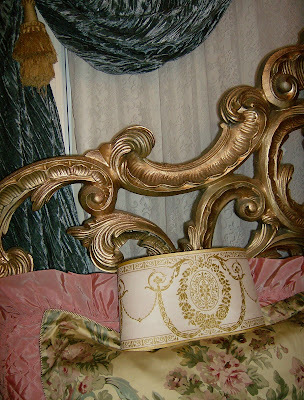 Remember the border I wanted to hang in La Boudoir? Well, guess what. It's discontinued. Believe me, I have SCOURED the net till I thought my eyes would bleed. There is none to be found. I even saw it on two different sites...put orders in and they emailed me back saying the border was no longer availabe and my card was not charged. I bet somebody SOMEWHERE has it, they just don't have it labeled right for me to find it. Grrr. What really makes me mad is that it is STILL availabe in OTHER colors! Alright, so the good thing is that I do have one roll of it. I love the color. I can have it color matched and go ahead with my crown molding. But I really wanted that embossed look of a lincrusta frieze, you know? Oh well. Sniff. I suppose I could save my shoe money and get the real thing. We'll see. I'd have to give up a lot of shoes. Love the sheets ~ never have seen any just like them before. Oh, how I shall cry with you for not being able to win that beautiful purse! Hope you find your border eventually ~ give me the pattern name & I'll help you look. All I can say is ~ Be still my heart! Win some, lose some. What you did get is fabulous! Maybe somewhere down the road you'll find more of those same things somewhere! They are gorgeous items, I can see why you are in mourning! Holy crap woman, should I mail you some of my Zoloft? Are you able to get out of bed after losing out on those bids? But at least you got the sheets! Are they really soft from being washed a billion times? Oh Girl! I can't get over your sheets...I do love them and what a wonderful find!! Your friend is a jewel! 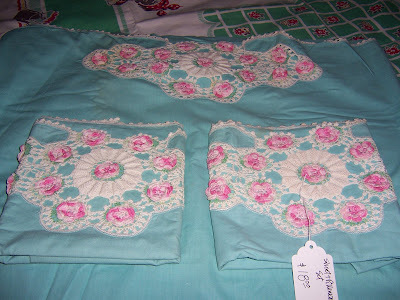 I have never seen anything like these...I am so excited for you...I had to pure gasp when I saw them and the other finds...the needlepoint purses ..... I wish you could have been the winning bidder on that blue one too, but the cottage one is precious!! I sure hope you find your wall paper border...it's gorgeous and just the right touch to go in your bedroom....You did good my friend really good! I'm Sorry, I didn't get over here sooner....I didn't get the chance to get on the computer yesturday... Robert's off on Friday's so we headed out the door yesturday, first thing in the morning... we went to Destin...I shopped til I dropped and until he dropped, LOL...then we went to the ocean and took in the sites and sounds there, and took some photos for the nature blog, and then headed back home and then I passed out on the couch before 8pm. LOL! I was pooped! LOL! All that shopping around wore me out! Imagine that... Do you ever do that to yourself?! 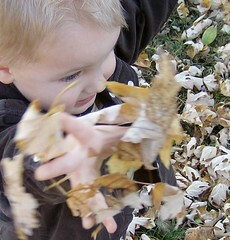 Having fun, sure can be a tiring thing sometimes....but, it was worth it. I found something I had been on the hunt for... a cottagey looking throw....I can't wait to show you it...I found it at Marshall's. It has the muted robins egg blue color with pink roses. It looks alot like the colors in those gorgeous ice skates you made! I'll be posting it next week sometime...talk to you again soon...Have a great weekend and enjoy those finds! I know just how you feel, that happens to me quite a bit. The handbag and the drapes are gorgeous. You know the drape panels sort of matches the handbag, isn't that something. You have very nice taste girl...I wouldn't mind shopping with you.